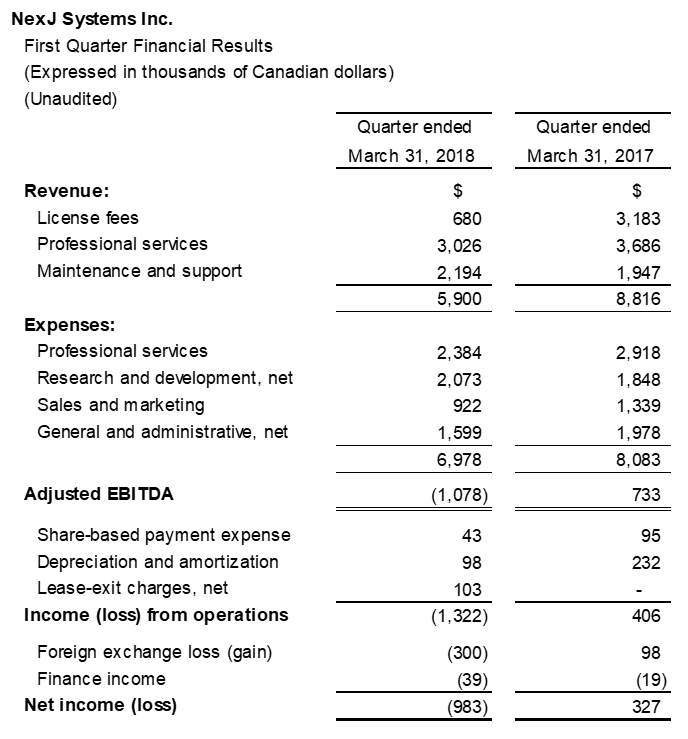 Toronto (May 10, 2018) — NexJ Systems Inc. (TSX: NXJ), a provider of intelligent customer management solutions to the financial services industry, today announced financial results for its first quarter ended March 31, 2018. NexJ Systems supports the world’s largest financial institutions and their use of NexJ technology delivers real business benefit. As recently announced, our intelligent customer management and intelligent agent software combine to deliver a holistic approach to AI culminating in delivery of machine learning cognitive applications. Specifically, NexJ Intelligent Customer Management learns and recommends the best action for the banker or advisor to maximize customer value. To further our intelligent customer management objectives, NexJ Systems announces changes to its leadership team. Effective June 1, 2018, Paul O’Donnell, currently serving as President, NexJ Systems will be appointed as Chief Executive Officer and Rajneesh Sapra, currently Vice President, Finance, will be appointed as Chief Financial Officer. In addition, NexJ Systems will be appointing William M. Tatham as Chairman of the Board, David Yach as Lead Independent Director and Errol Singer, outgoing Chief Financial Officer, will become an advisor and observer to the Board. The Board is pleased with the composition of the new leadership team and fully supports the appointments. As founder and Chairman of the Board, Mr. Tatham will continue to guide the strategic direction of the Company. Mr. O’Donnell is a proven strategic operational leader who has focused on building companies both organically and through strategic acquisition. As an experienced operator he has managed growth through direct sales, reseller partnerships and OEM distribution. Mr. O’Donnell joined NexJ as a strategic advisor in 2017. Prior to that, he held senior executive roles in technology companies including President of OpenText Americas Chief Operating Officer for PEAK Technologies Europe, Chief Revenue Officer of Intelex Technologies and Chief Revenue Officer for 360insights. With more than 25 years of experience, Mr. Sapra is a finance professional with international experience who brings a wealth of knowledge and expertise to the management and delivery of NexJ’s fiscal responsibilities and provides an objective voice on issues impacting operational effectiveness. Prior to joining NexJ, as a Chartered Professional Accountant, Mr. Sapra was Senior Manager at KPMG LLP in their technology audit practice in Toronto. Prior to that he held positions with public accounting firms across the globe. He currently serves as a Board Member for CPA Ontario’s Public Accounting Licensing Board and Toronto Chapter of the Institute of Chartered Accountants of India, respectively. NexJ Systems will be hosting an earnings report conference call on May 10, 2018 at 5:00 p.m. ET. The call can be accessed via webcast or by phone by dialing 647-427-7450 (Toronto local or international) or 1-888-231-8191 (North America Toll Free). Investors should dial in approximately 10 minutes before the teleconference is scheduled to begin. A replay of the call will be available beginning on May 10, 2018 at 8:00 p.m. ET through 11:59 p.m. on May 17, 2018 and can be accessed by dialing 416-849-0833 (Toronto local) or toll-free at 1-855-859-2056 and using password 8081069. This news release includes certain measures that have not been prepared in accordance with International Financial Reporting Standards (“IFRS”) such as Adjusted EBITDA and Adjusted EBITDA margin which are used to evaluate the Company’s operating performance as a complement to results provided in accordance with IFRS. The Company believes that Adjusted EBITDA and Adjusted EBITDA margin are useful supplemental information as it provides an indication of the results generated by the Company’s main business activities prior to taking into consideration how those activities are financed and taxed and also prior to taking into consideration asset depreciation and the other items listed below. The term “Adjusted EBITDA” refers to net income (loss) before adjusting for share-based payment expense, depreciation and amortization, lease-exit charges, net, deferred share unit expense, foreign exchange gain (loss), finance income, finance costs, and income taxes. “Adjusted EBITDA margin” refers to the percentage that Adjusted EBITDA for any period represents as a portion of total revenue for that period. NexJ Systems is a provider of Intelligent Customer Management solutions for the financial services industry. Individually, NexJ Systems’ award winning products use artificial intelligence to improve customer service and increase advisor and banker productivity. Together, the Intelligent Customer Management suite delivers a continuously-learning, cognitive application that recommends the right intelligence-augmented actions for users to deliver personalized customer service at scale and grow their business. Based in Toronto, NexJ Systems has clients throughout North America, Asia Pacific and in Europe. For more information about NexJ Systems visit www.nexj.com, e-mail info@nexj.com, or call 416-222-5611. Join us on LinkedIn, follow us on Twitter, subscribe to our YouTube channel, like us on Facebook or hang out with us on Google+. Certain information in this press release contains forward-looking information within the meaning of applicable securities laws (also known as forward-looking statements), including, among others, statements about the financial conditions, and results of operations and earnings, with respect to ability for machine learning and AI technology to address issues faced by the financial services industry, NexJ’s benefits from expansion of artificial intelligence capabilities, and changes to NexJ’s management structure. Forward-looking statements generally can be identified by words such as “could”, “expects”, “may”, “should”, “will”, “anticipates”, “believes”, “intends”, “estimates”, “targets”, “plans”, “envisions”, “seeks” and other similar language. These statements are based on the Company’s current expectations, estimates, forecasts and projections about the operating environment, economies and markets in which the Company operates. These statements are subject to important assumptions, risks and uncertainties that are difficult to predict, and the actual outcome may be materially different. The Company’s assumptions, although considered reasonable by the Company at the date of this press release, may provide to be inaccurate and consequently the Company’s actual results could differ materially from the expectations set out herein. The risks and uncertainties that may affect forward-looking statements include, but are not limited to: (i) our dependence on a limited number of customers and large project size; (ii) fluctuation in our quarterly operating results; (iii) our dependence on key personnel and our compensation structure; (iv) risks associated with managing large and complex software implementation projects; (v) uncertainties and assumptions in our sales forecasts, including the extent to which sales proposals are converted into sales; (vi) risks associated with our ability to design, develop, test, market, license and support our software products on a timely basis; (vii) market acceptance of our products and services; (viii) commercial success of products resulting from our investment in research and development; (ix) our success in expanding sales into new international markets; (x) competition in our industry; (xi) failure to protect our intellectual property or infringement of intellectual property rights of third parties; (xii) reliance upon a limited number of third-party software products to develop our products; (xiii) defects or disruptions in our products and services; (xiv) currency exchange rate fluctuations; (xv) lengthy sales cycles for our software; (xvi) global financial market conditions; (xvii) failure to manage our growth successfully; and (xiii) failure to successfully manage and integrate acquisitions. For additional information with respect to risks and other factors which could occur, see the Company’s most recently filed Annual Information Form for the year ended December 31, 2017 dated February 21, 2018, and other securities filings with the Canadian securities regulators available on www.sedar.com. Unless otherwise required by applicable securities laws, the Company disclaims any intention or obligations to update or revise any forward-looking statements, whether as a result of new information, future events or otherwise.